NASCAR fans are a bit outraged at the fact that the series swore they’d crack down on Chase for the Sprint Cup competitors who failed the post-race technical inspection, and Chicagoland Speedway winner Martin Truex Jr.’s car failed after that anyway. But it’s by such a minuscule amount that NASCAR may not even bother, and I can’t even care. Both the No. 78 Furniture Row Racing Toyota of Martin Truex Jr. and the No. 48 Hendrick Motorsports Chevrolet of Jimmie Johnson failed post-race laser inspection, per NASCAR. This is the second week in a row Truex’s car has failed NASCAR’s laser inspection system, which makes sure all the measurements on the car are in-spec for the series. The right rear of our car was well within the tolerance margin, which showed that we were trying to be conservative. However, the left rear wheel alignment was off by approximately ten-thousandths of an inch, which in high probability was due to damage in that area as a result of being hit by the No. 4 car. That equates to just 0.01 degrees of toe off in their alignment, per a tweet by No. 78 crew chief Cole Pearn. However, NASCAR’s finish-disqualifying crackdown only applies to cars that are 0.12 degrees or more off in alignment on both sides, per ESPN. 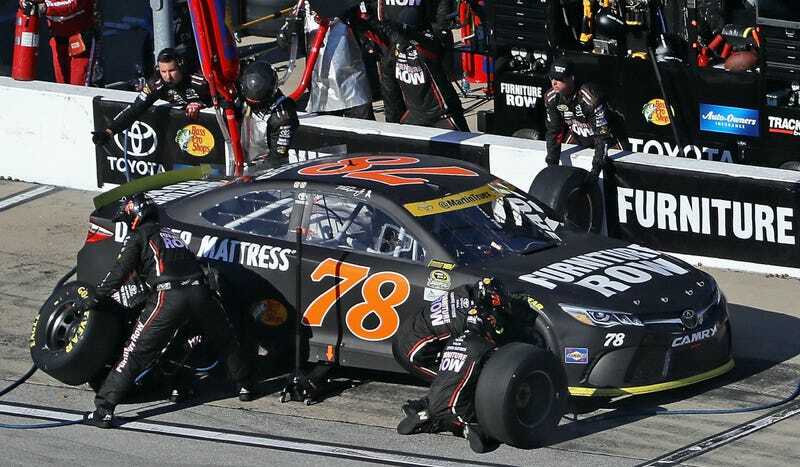 Thus, it is unlikely that NASCAR will do much to Truex’s team, although NASCAR’s write-up of the failures suggests a penalty is on the way for Johnson’s team. While it sounds bizarre that NASCAR would be lenient on anyone after announcing a crackdown on laser inspection failures, the series’ addition of some wiggle room to allow for contact only seems fair. Goodness knows, NASCAR plays rough with each other, and having a car bumped out of spec by contact is 100% myth plausible. If that’s the case, let Truex and his team enjoy the win and move on to the next round of the Chase. They weren’t at fault in the incident with Harvick’s car, so it certainly doesn’t sound like an intentional failure. After all, it was crappy to see IMSA’s Magnus Racing lose their podium finish in the WeatherTech Sports Car Championship series due to an inspection failure by less than 1 millimeter. Like Furniture Row Racing, the Magnus team says their failure was also caused by contact on track. If I’m going to feel gutted for that team over their garbage penalty, I can’t rationalize calling for Truex to lose his win, either. There’s a big difference between stuff like that and the more intentional post-race inspection failures we’ve seen this year where crew members are slamming the rear quarter panels of a car to improve the car’s handling. Disqualifying finishes for a car that’s out of spec after being hit during a race simply isn’t a thing that should happen—even if it’s the same category of post-race inspection failure we’re all tired of hearing about. If they discover evidence that Truex’s car was off on one side intentionally, sure, throw the book at him. Otherwise, for this small amount, don’t. That’s only fair. NASCAR penalties usually drop on Tuesdays, so we’ll find out then if the series will do anything to either failing car. NASCAR will eliminate the P2 and P3 penalties [for laser inspection failure] it introduced a week ago for failing the Laser Inspection Station after the race. Both Truex and Johnson faced P2 penalties, which would have been 10-point deductions. Steve O’Donnell, NASCAR executive vice president and chief racing development, said although both had similar infractions, their penalties would not be equal. By virtue of his win, Truex advances to the second round regardless of the penalty, but Johnson could see his chances of advancing hurt because of losing 10 points. So, there we have it. Of course, the flip side is that now teams know they can be further out of NASCAR’s mandated spec without triggering a race-ending penalty, but for the sake of cars that might be damaged out of spec during a race, it’s good that there’s some buffer room.